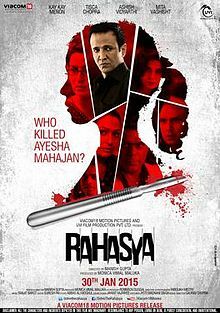 Rahasya is a solid police procedural, with an intriguing pool of suspects in the murder of a teenage girl. Inspired by a real case, the movie elucidates the way ordinary secrets can come back to haunt us. The mystery begins when the body of 18-year-old Ayesha Mahajan (Sakshi Sem) is discovered by the family maid, Remi (Ashwini Kalsekar). Sometime between 11 p.m. and 6:30 a.m., Ayesha was murdered in her own bedroom, her throat slashed. It seems obvious to police Inspector Malwade (Nimai Bali) that Ayesha was murdered by her father, Dr. Sachin Mahajan (Ashish Vidyarthi). Dr. Mahajan was angry at discovering his daughter’s sexual relationship with a Muslim neighbor boy, Riyaz (Kunal Sharma), and he killed her in drunken fit of rage, Malwade assumes. Never mind that Riyaz is nowhere to be found, and that the other member of the household staff, Chetan (Manoj Maurya), also absconded during the night. The case draws the interest of Central Bureau of Investigation agent Paraskar (Kay Kay Menon), who finds the answer offered by the police too convenient. Specifically, he doubts that Sachin could have slashed Ayesha’s throat so precisely given how drunk he was. Paraskar’s investigation — with the help of his dutiful assistant, Parvez (Abhinav Sharma) — uncovers additional motives that shine the spotlight on everyone from staff members to neighbors. It also puts Paraskar in the crosshairs of the real killer. Menon’s captivating performance is the main reason to watch Rahasya. Writer-director Manish Gupta knows this, so he employs closeups of Menon’s face liberally, encouraging the audience to focus on his star. Detective Paraskar’s initial quirkiness is short-lived, allowing the character to establish an identity distinct from all the Sherlock clones out there. He’s meticulous and principled, chasing down each lead while ignoring his wife’s suggestion to just take a bribe and be done with it. The mystery itself is compelling, with each suspect and theory laid out in turn. Only during Paraskar’s final reveal do things slow down. Right when the audience wants the answers, director Gupta delays with flashbacks and interruptions by the suspects. It’s not a fatal flaw, but it is frustrating. Gupta’s spin on a true crime story highlights the dangers of jumping to conclusions. While everyone is innocent until proven guilty, those with the strongest motives may be those you least suspect. This entry was posted in Reviews and tagged 2015, 3 Stars, Abhijeet Sandhu, Ashish Vidyarthi, Ashwini Kalsekar, Bollywood, Hindi, Indian, Kay Kay Menon, Kunal Sharma, Manish Gupta, Manoj Maurya, Movie Review, Nimai Bali, Rahasya, Sakshi Sem on September 15, 2015 by Kathy. That must be the Talwar case. Must be worth a watch! Thank you. It will be interesting to compare it to another movie about the case, Talvar, which releases on October 2. Yes. Look forward to reading your review of the same! Bollywood cinema is two sides of coin. One is great indian cinema. We can take proud on that. Like swadesh,lagaan,awaara, pyasaa shri 420, mera naam joker, 3 idiot, gangs of wasseypur, znmd, like star on earth, mother India etc….. Second one is dumb idiot stupid cinema. Filmmaker making shamelessly rip off unofficial remake stolen lifted movies rather being ethical and loyal. Another thing is that Bollywood now days break the yardstick. Goes to abroad n got tremendous success. This scenario in far different .Bollywood so called 100 n 200 club got huge success. As far as quality is concerned there is no artistic value. Many people are bashing on that. Indians cinemas undivided part dancing music n songs makes cinema unique in the world. Apart from that director forcefully unnecessarily put blends of cheap double meaning ridiculous n female objectivity item songs. Kathy mam, we enjoyed a lot your reviews. I meant to say indian cinemas dance songs music makes differentiate across the world cinema. I know foreign cinema has also dance song but their is in only the musical drama genre. Here is in almost every genre like action thriller comedy romance. Obviously,its hard to make a movie. To be honest ,Bollywood always been criticized for accusation of plagiarism. Besides, great Bollywood movies also makes proud to every Indian too. Massive gratitude mam… From India with love . Good call Sid. I watched The Stoneman Murders on DVD over here in the UK and thoroughly enjoyed it. I tend to prefer more upbeat movies, but as suspenseful thrillers go Stoneman is superb. Some of the acting and cinematography is top-class. Kahaani fame director sujoy Ghosh directed epic thriller Bengali language short film ahalya. Link http://m.youtube.com/watch?v=Ff82XtV78xo..